I planned my 2011 trip to New York City around The Book of Mormon. In fact, my NYC theater buddy and I were so focused on getting tickets that we didn't immediately realize that our trip coincided with the 10th anniversary of 9-11. Which actually turned out to be a really fortunate "coincidence." There's nowhere else I'd rather be on that day. But back to the show. I saw it described somewhere as "sweetly irreverent," and I can't think of a better way to say it. The creators Matt Stone, Trey Parker (the creators of South Park, of which I have yet to see a single episode), and Robert Lopez (Avenue Q, one of my favorite new musicals, which has a similar feel) are somehow able to walk that fine line. They've created something that's the foulest thing I've ever seen on stage, but with a really wonderful heart and a great message. It works, and (most) people get it. 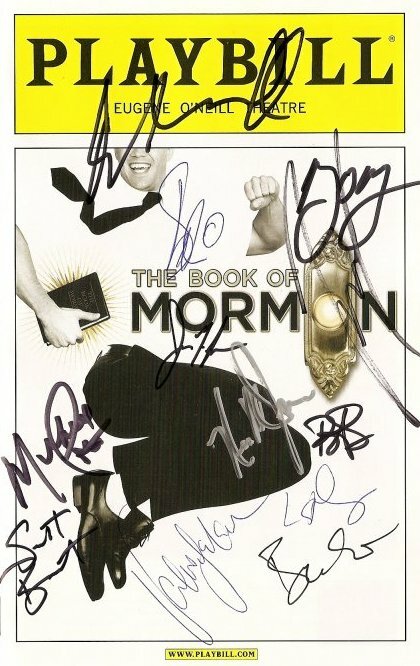 So much so that The Book of Mormon won nine Tony Awards this year (including Best Musical, Best Score, and Best Book), and tickets are hard to come by. It's that rare creation that's a critical and popular success. The musical tells the story of two Mormons who go on their mission to Uganda. For Elder Price, the good and earnest overachiever, Africa is not what he had planned for his future. He wants to do "something incredible," and doesn't feel that Africa is the place to do it. His companion, the socially awkward compulsive liar Elder Cunningham, is thrilled to finally have a "best friend" and is content to sit by and watch as he does big things. They soon find out that the African mission has not baptized a single new Mormon, and is in danger of being shut down. Elder Price decides to get out and go somewhere he can made a difference, but Elder Cunningham decides to "man up" and takes an unconventional approach to converting the Ugandans. The cast of this show is so talented, and we were fortunate to meet many of them at the stage door (see playbill above).﻿﻿ Josh Gad is adorkable as Elder Cunningham, and has created a character so specific that I'm curious to see how it's interpreted on tour (i.e., will they just cast a Josh Gad impersonator?). 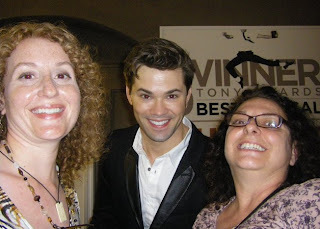 Andrew Rannells has a great voice and is very believable as the young idealistic man whose dreams don't take the form he thinks they will. Nikki M. James deservedly won a Tony for her role as Nabalungi, the sweet and open-hearted daughter of the village leader. I was thrilled to recognize Michael Potts from the 2009 Guthrie-commissioned Tony Kushner play Intelligent Homosexual’s Guide to Capitalism and Socialism with a Key to the Scriptures. He said he had to choose between reprising his role in that play on Broadway, and this role - tough choice! The Book of Mormon may seem to be poking fun at the Mormon religion on the surface, but I think it's a really wonderful exploration of faith and religion. Different cultures interpret religion through the lens of their experience, and myths change to suit the audience. In the end, people find stories that help them explain the world they live in and give them comfort about their uncertain future. Kind of like what musical theater does for me.